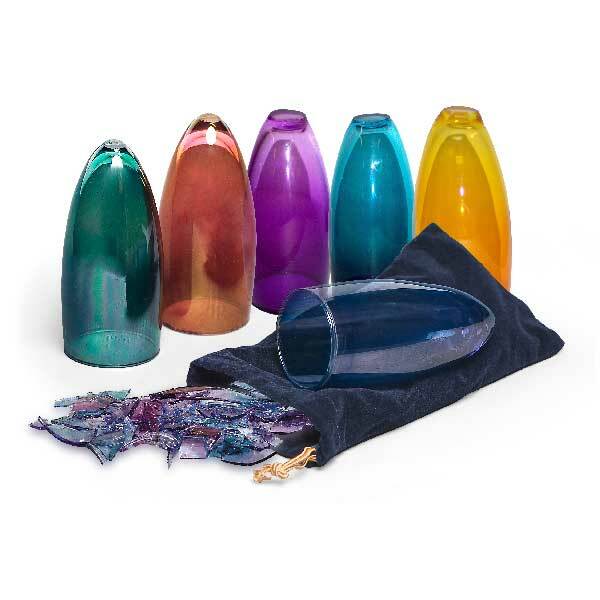 The polymers in the acrylic make this gift virtually scratch, dent, and shatter proof! As soon as we receive your broken glass, your lucite gift gets sent for manufacturing so we can get it out to be enjoyed by your loved ones as quickly as possibly - anywhere in the world. Memories That Last a Lifetime in Lucite! You've seen our collection in Jewish periodicals, Judaica stores, and Synagogue gift shops all across North America & Europe, and now you've found the Source! Imagine the actual broken glass or light-bulb from your wedding ceremony suspended in a crystal-clear Lucite® Wedding Cube, Tree of Life, Wedding Invitation, or Mezuzah for you to keep forever or give as a gift to a new couple. Cherish that magical moment when the glass is broken and then --- frozen in time --- forever! For over 20 years The Tresured Collection has hand crafted over 10,000 crystal-clear Lucite Wedding Cubes, Mezuzahs, Trees of Life, and Invitations for happy couples all over the world. Each of our Lucite items are pain-stakingly hand-cast by skilled artists who embed each shard of glass by hand, and then carefully hand-sand, buff, polish, and engrave your gift to your specifications: beveled or squared-off edges; your choice of engraving type-styles and colors. Each Treasured Collection Cube, Tree of Life, Invitation and Mezuzah is then inspected, re-polished, hand-wrapped and shipped by UPS directly to you or the gift recipient. We also custom-embed your "collectibles" such as photos, tickets, coins, etc. Call us to find out how! 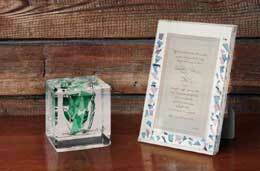 1) Select and purchase the Wedding Glass Keepsake Item you are interested in. 2) Download the order form. Click here if you require a shipping box to send your broken wedding glass shards to us. This unique gift is an eternal reminder to the bride & groom of their cherished love, that is perfect for a shelf, coffee table or mantle. Just a note to say thank you to the magnificent artist who created the wedding cube from the glass broke at my daughters wedding It is simply a lifetime treasure of the event made with skill and inspiration. We are all so grateful. Please pass our appreciation on to the talented artist who created it. Dear Administrator, As a wedding gift for a second marriage we received the rectangular wedding glass lucite tube and it was - and still is - our most favorite gift! My son married last August and I gave one to them. They love it as we love ours! One evening he called to say that he had been busy studying, looked up, saw the cube, and smiled at its beauty and the love it represents and that he wanted to thank us again for such a marvelous gift. Pictures do not do it justice!